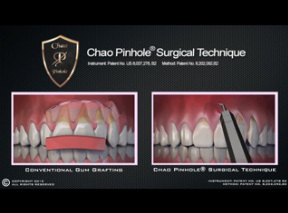 To learn more about the Pinhole Surgical Technique, please contact our Atlanta office. Dr. David Pumphrey graduated with his dental degree and postgraduate certificate in Periodontics from Emory University School of Dentistry. He has been practicing dentistry, specializing in Periodontics and Dental Implants since 1986. Dr. Pumphrey is a member of several esteemed dental societies including the American Academy of Periodontology, Academy of Osseointegration, Georgia Dental Association, International College of Dentists, and Pierre Fauchard Academy. He has held several positions of leadership in the Georgia Dental Association, as well the past President of the Northern District Dental Society. Additionally, Dr. Pumphrey has lectured on the topics of Implantology and regeneration techniques and has been published locally and nationally. His drive for excellence in dentistry shown through participation in higher levels of continuing education in the fields of surgical cosmetic procedures, the interrelationship of occlusion and dental stability, periodontics and dental implants. Most recently, Dr. Pumphrey became a certified Pinhole Surgical Technique clinician. During his leisure time, Dr. Pumphrey enjoys golf, tennis, fishing and landscaping.